Well the hobby has certainly gotten into the blood of me and my missus. 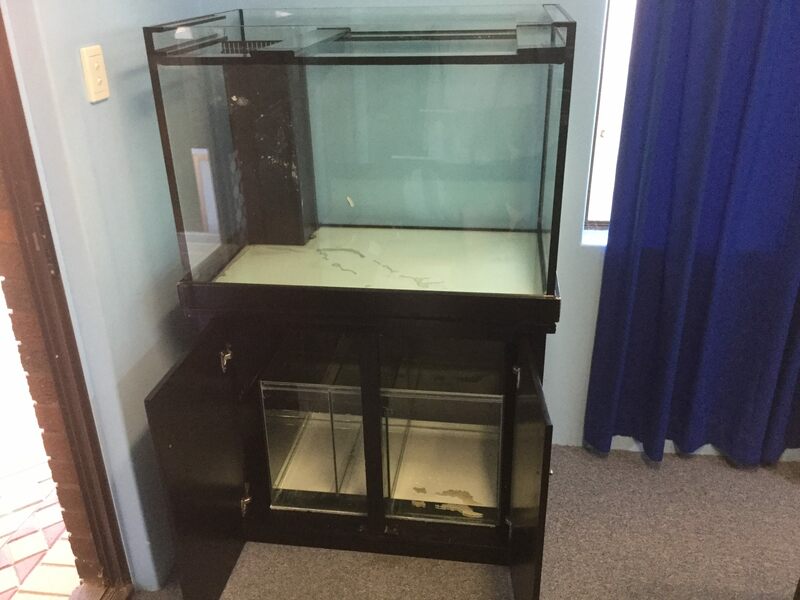 I've purchased a second tank from someone on Gumtree for $150 (lets not mention the rack from Bunnings that's been purchased or the quote on 3 extra tanks to go on the rack from aquotix). I think I got a decent bargain on the tank as it used to be a marine tank but some mid twenties bloke finally got off his arse and moved out of home so his parents wanted it gone. 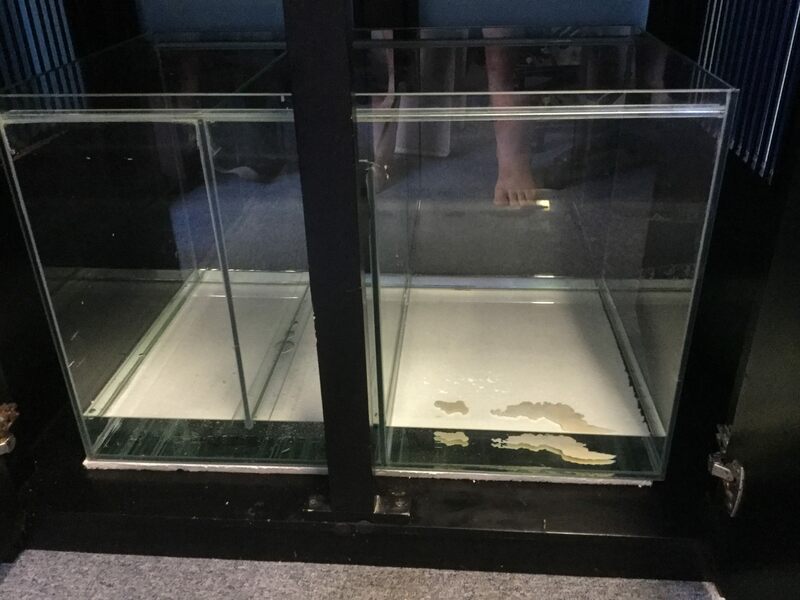 It's 3*2*2 made from 12mm glass (no idea why on such a size tank but i'm not going to complain) on a cabinet which has a 70*43*47 sump in it. It also came with pumps etc etc. Most of the equipment was so covered in old rock hard salt that I'm not sure it's worth keeping but the wife wants to do marine one day so it's all thrown into a box. After a clean, scrape, soak in vinegar, scrape, clean, more scrape and more clean it now looks like this. 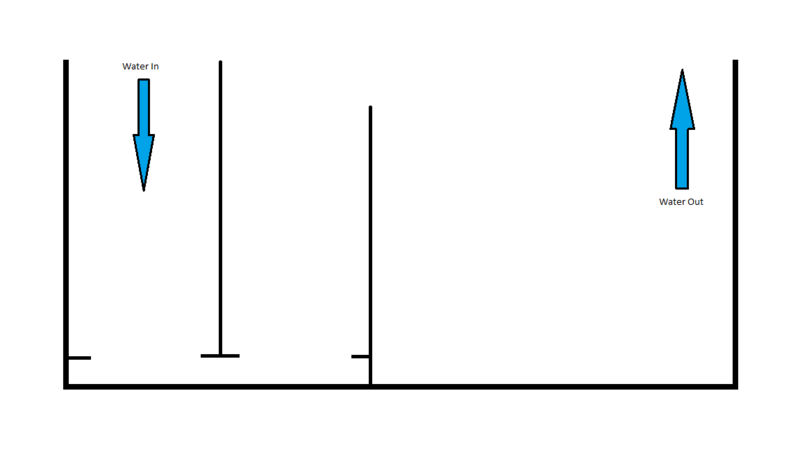 So my current thoughts is I would put some of that plastic grid stuff on the ledges in each of the first two zones? Followed by different density foam plus the white filter wool in the first zone with a bunch of filter media in the second zone? 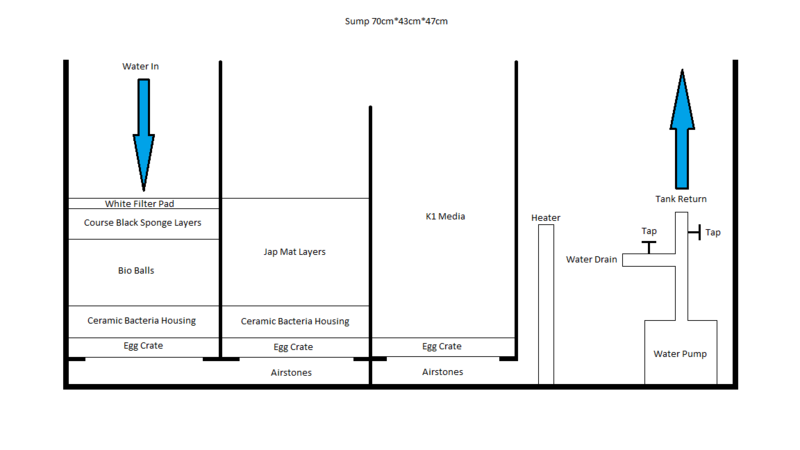 Lastly I would just have my heaters, water pump, airstones and seeding sponges in the last zone? If this isn't correct or if anyone has any better solutions any help would be greatly appreciated. Edited by Muttley, 28 December 2017 - 10:48 PM. If you have gotten quotes at aquotix have a chat to ollie and the crew there about sumps and the best set up (if you have some spare time). They've set up 4 tanks for us from small to big with sumps in all of them including grow out tanks underneath when there has been space. You'll want high surface area on all material in the sump over all and fine filter to start. All up it depends on your stocking and perhaps budget. Most people will run fine filter then Jap in their first section, tumbling media like oase in the next then all the hardware in the last section. It will be great to hear other people's experience however I've found ceramic tubes are worthwhile loading up in your sump even though they tend to get a bit mucky with time. Every one always recommends keeping the final pump section empty and just have pumps in it however I always dump more media in it whether its a few bags of ceramic media or a few super high surface area ceramic bricks. You have loads of room in that final section to add more ceramic in that space but it gets filled very quick with heater pump and UV. Things that i've found are a pain to do later and worthwhile doing first up. Airstones / hoses to the underneath of any sump section once the sump is established, total pain in the arse and you wont bother. Can help keep detritus off the media and can increase the effectiveness of the media. Cheap power heads to circulate water in the sump to clear the detritus sporadically. Moulded background. If it is your thing do it now. You can hide more media behind them. Power, mount your boards and have surplus now as once its against the wall you'll end up running a power board inside the cabinet and outside the cabinet and it gets messy. A few wave makers, a couple power heads, a couple air pumps, a heater, a UV. Adding a cooler and a small power head in my sump recently maxed out my set up in my 4 footer for power boards. Extra plumbing, the guys at my LFS hooked me up with a quick/easy drain in our tanks making water changes simpler and quicker. I dont always use the filler float valve however always use the drain to 1/2 plumbing. Edited by chrishaigh82, 29 December 2017 - 08:52 AM. Thanks for the reply Chris, I went in and had a chat to Mattia which solved all my issues and I walked away with the supplies to do the sump. I'll post some quick mock ups I did based on Mattia's drawings so if anyone in the future is a newbie like me looking for info there are pictures here. This is the final result of what i'm going with for the moment. 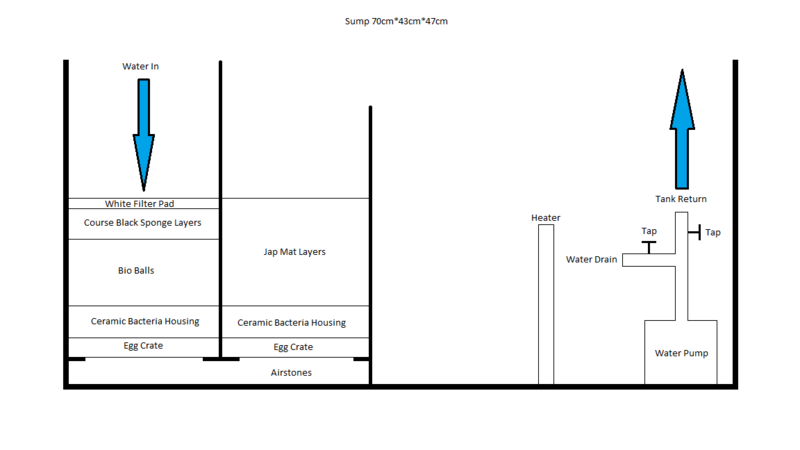 This is what i'm considering doing based on room in the sump (it's quite small) but I want to play so it's likely. I want to play with the K1 media even if it's on a small chamber and it only involves siliconing in one more glass panel to achieve. Big shout out to aquotix for the great service. Edited by Muttley, 30 December 2017 - 07:24 PM.